CPT Tranchemontagne, 32, of Portland, ME, died of a non-combat cause at Walter Reed Army Medical Center. Daniel was assigned as a staff officer with the 368th Engineers in Kuwait until he was diagnosed with an illness and evacuated to Walter Reed. To honor CPT Daniel J. Tranchemontagne, his younger brother, James Tranchemontagne retrieved this stone from their family camp in Sand Pond in Sanford, Maine. Watch this video to learn why this stone is significant and what it says about CPT Daniel J. Tranchemontagne. Our son, Daniel John, was born in Pascagoula, MS on December 26, 1971 the fourth of six sons. He was raised in Sanford, Maine and graduate from the Sanford High School in 1989. As a student in grade school, Daniel was always willing to help other students regardless of their abilities. In high school Daniel worked in children’s summer program. He was constantly amazed at the progress the children made during the summer. We knew our son was compassionate and would do well in the future. Daniel was active in scouting, wrestling, soccer, track and Key Club. He liked the friendship, comradely, and the service that some of these organization accomplished. He always volunteered for projects. He coached the boy’s youth soccer team in Sanford. Giving time was a joy for Daniel. His name is inscribed in a memorial monument at the Soccer Field in Sanford. Daniel began his secondary education at the University Southern Maine in Gorham where he was in the Reserve Officer Training Corps and a prominent member of Sigma Nu Fraternity. Prior to his junior year, he transferred to Norwich University in Northfield, Vermont where he was a member of the Artillery Battery. Daniel always wanted to be in the military. He was always impressed with his older brother Marc who graduated from Norwich as a Naval Officer. In 1993, Daniel graduated with a Bachelors Degree in mathematics and was commissioned a Second Lieutenant in the United States Army Reserve. He served as a Platoon Leader, and later commanded Company A, 368 Engineering Battalion— Combat Heavy. Daniel’s aspirations turned to teaching in 1996. He returned to USM to earn a certification in teaching and a Masters Degree in education. Daniel was disappointed in not being chosen to be an active duty officer but as a reserve officer. When he came back from his days and months of training he saw an advertisement for the Extended Teacher Education Program at USM. The decision to participate in the training came from his days as a substitute teacher while in he attended college. He really enjoyed working with kids and had found his calling. For six years Daniel was an admired mathematics teacher at Scarborough High School. I was at Lowes in Biddeford when the cashier saw my credit card. She asked if I knew Daniel and I told her he was my son. She told me that if it wasn’t for Daniel, her son would have never graduated from high school. She said, “Daniel would call me home in the evening to remind me to remind my son that he had homework.” She told me she had Daniel’s picture in her bible. She was proud that her son was married and had a good job. We shed a lot of tears that day, both of us grateful for our sons’ accomplishments. Daniel was an assistant wrestling coach at USM and introduced the wrestling program to Scarborough High School. A scholarship has been endowed for college bound seniors in his memory. Daniel would be proud knowing his wrestling contributions and determination for a higher education would continue to live in future students. During his life, Daniel traveled throughout the United States, Mexico, Kenya, Korea, Belize and much of Europe. He was a recreational scuba diver, distance runner and loved dancing. He volunteered to chaperone every Scarborough High School prom. Daniel believed in living life not watching from the sidelines. In November of 2002, Daniel was called to active duty in support of Operation Iraqi Freedom. He served in Kuwait as a Staff Officer with the 368th Engineer Battalion until he was diagnosed with cancer. When a grown child has volunteered to protect his country and its people, you imagine the many ways that death can happen. You pray for their protection from a roadside bomb or sniper fire, and you forget about the commonality of disease. In January 2004, Daniel was evacuated to Walter Reed Hospital in Washington DC. Daniel had served in Kuwait for ten months. He always gave up his chance to come home to the younger, married enlisted so they could be with their families. Daniel died at Walter Reed Hospital on May 30th, 2004. At Daniel’s funeral, the church was overflowing with students, fellow soldiers and hundreds of family members, friends and colleagues. Daniel was respected and admired by his peers, students and soldiers alike. More than once at the wake, men and woman soldiers said the Daniel had changed their outlook, not only about the military but also about life in general, and they said they would never forget him. The mess hall was named after Daniel. Daniel always spoke with pride about his association with Norwich University and stressed the motto to his soldiers and students, “Essayons—I will try”. There is no greater legacy than to instill a determination in those we lead. There is not a day that goes by that our son Daniel is not in our prayers and thoughts. Thank you for your words about Dan. What a wonderful man who will be missed by so many. I was one of those people you mentioned, one that Dan just started talking to on a Contiki tour to Ireland (one of many–I’m sure he was best friends with half the tour by the end of the trip). For days on end on the bus, at meals, in bars, we chatted about life. But I finally had to stop him because he kept going back to his Army Reserve unit. He loved the kids he was teaching, and we’d discuss that, but he just wanted to talk Army. I was at the end of my active duty Army time, this was my last trip before heading home for good and the last thing I wanted to discuss was work. But he just loved it so much there was no stopping him. I told him I felt like a bus driver taking a bus trip for vacation. But who could deny that smile? Not too long after that trip, 9/11 happened. We discussed how frustrating it was not being in active duty units at the time. We shared our frustrations at the entire situation. And then both our units, an entire country away from each other, were set to deploy at the same time. We encouraged each other and talked through the logistics of leaving our now-civilian lives to go with our units. In the end, I couldn’t deploy due to an injury, but Dan went on. Of course he did. While he was gone, we chatted about his big plans for proposing to Holly and how he could do that from afar. Eventually, his emails were a bit not-to the-point when I’d ask him details about the proposal, how he managed it from Kuwait. He always turned the topic back to my adventures, newly married, setting up a home, school. He wanted to know all about it all. Finally, he told me he’d been sent back to the States, that he was sick and just how sick, without one defeatist word. I asked why he didn’t tell me sooner, that I’d wish I’d known he was in a closer time zone. And he said he knew I was studying for the Bar exam and didn’t want to stress me out. Because that’s who Dan was. He was facing a horrific diagnosis and he’s worried the news of it might stress me? He was a protector, a fighter, a teacher, and a friend. To say Dan will be missed just doesn’t hit the mark. The world is missing out on him. Dan was a man that inspired generations. I had the distinct pleasure of serving side by side with him. An honor I will truly cherish. I miss him, his antics, stories and most of all his undying love for his troops. I know he is looking down on us all. RIP Brother for you fight is fought…HOOAH! Thank you for sharing the stories of Dan. I was one of his co-workers at Scarborough High School. Like you mentioned Dan was always someone who would be there to talk to you if you needed it. I remember many times he would talk to me about a hardship I was going through at the time. He was a great teacher and always had an energy to his teaching that made Math fun for the kids. We continued to talk when he was on duty overseas and in fact I still may have those emails saved on my drive at school. We lost him too soon but it’s moments like these when someone can be scrolling down a page on Facebook and come across a link about that person you lost. Thanks for sharing his memory with me. Through your words you are keeping him alive. I am to be one of the honored to carry Dan’s stone to Mt. Katahdin. James, thank you for letting me in on his personal life. He truly was a hero and a very special man. I began my teaching career with no real sense of patriotism. When my brother-in-law was killed in Afghanistan in 2010, that all changed. I took on a self-directed goal to instill in my students a sense of respect for our Veterans, knowledge of the sacrifices made by those in uniform and awareness of the courage it took to make those choices. I started the Take a Vet to School program and the Interview a Veteran programs at my school in 2011. These programs connect students with Veterans and help them to understand the meaning of service to one’s country. I’m always amazed at what my students remember about “their” veteran even as they leave middle school- and how they connect the experiences their veteran had with people familiar to them. This was all very fulfilling for me; to pass on to students’ values and beliefs that seem to have started to disappear from our culture. I didn’t realize that what I was missing was the honor and respect owed to our Fallen. When my friend Shawn approached me and asked if I’d like to hike Katahdin with him in the spring of 2014, I said yes, aware that it had something to do with honoring our military personnel in some way, but not really sure what I was signing up for. I contacted Maj. Cote and read up; the Summit Project seemed to fit in with my personal goals and appeared challenging but not impossible. As I prepared for the hike on Memorial Day weekend, I thought about the hero whose stone I’d be carrying- CPT Dan Tranchemontagne from Scarborough. I had no connection to CPT Tranchemontagne other than my choice of profession and what I learned about him, both as a teacher and a learner guided me in my approach to the event. He was kind, caring, had a great sense of how to motivate peers and students and always strived to be at his best. The day of the hike was quickly upon me. I packed my bag with all the gear suggested and put Dan’s stone on top. Each time we stopped for a break, I opened my pack and saw the stone- it reminded me that I was hiking to remember and honor Dan and the other Fallen Maine soldiers. Each time I saw his initials and dates, I thought about Dan’s family- how much they must miss him; how beautiful the day was and what a perfect way a team hike was to honor the memories of our Fallen soldiers; how I could share this experience with my students; and the courage Dan must have shown both during his deployment and his time at home. When we approached the top, we had a small ceremony. Like many others on my hiking team, I had a hard time keeping my emotions in check. I spoke with tears in my eyes and a lump in my throat- just a few words because I knew that speaking more wouldn’t be possible. The hike back down passed quickly- so quickly we stopped only once. Our team arrived back at the campground and met with the other teams. We returned the stones we carried to families of the Fallen and received patches. My emotions again ran high, and the support from my team as I completely broke into tears was overwhelming. Families of the Fallen thanked me for participating in the hike and I was so proud that I had given something as small as a weekend and some physical discomfort to honor their sacrifices. Dan’s family was not at the event, but I spent a lot of time thinking about them that day. Whenever I speak with my students about anything relating to Veterans or Fallen soldiers, my thoughts now go to Dan as well as my brother-in-law. The experience of participating in TSP at BSP 2014 was such a rewarding and positive experience that I’ve signed up to participate in TSP at Cadillac in the fall of 2014. I’ve shared my experience with many of my friends- many of whom have expressed interest in future projects. I hope that they are able to experience the many emotions, sense of camaraderie and inner strength I didn’t know I had should they choose to honor our Fallen. This is the second hike I’ve made with CPT Tranchemontagne’s stone. When I hiked Katahdin, I was so full of emotion it was hard to speak at the summit and even harder when we met the families at the bottom. Katahdin was a learning experience for me. Hiking Cadillac last weekend was a different experience. Having learned about Dan and by extension myself, I shared what I learned with my friends and brought my enthusiasm for TSP into the local community. I was excited for my friends to join me for the Cadillac hike- I helped them get ready and could see that they were becoming excited for the event. When we reached the summit of Cadillac, I was able to articulate my feelings about Dan, our Fallen and TSP. I’m proud to honor Dan and other Fallen soldiers; and to have brought people to TSP who share the same values I do. My participation in the TSP events make me a better person and a better teacher. I hope that Dan would be proud of his influence in my life and proud of how his sacrifice has enriched the lives of others- without him, I would not have carried a stone on the hikes and would not have shared my experience with my friends, bringing them to TSP. When I carried CPT Tranchemontagne’s stone up Bradbury I felt the weight of the stone and at the same time I felt the weight that his absence must bring upon his friends and family and fellow soldiers, even the weight that he felt while fighting for his country. I thought about how he must have felt while serving his country, I thought about what he must have missed his friends and family while serving and how they miss him now that he is gone. I thought about how brave he is even though he did not die in combat and how that doesn’t make him any less of a hero. I thought about how he must have felt when he had to say goodbye to his friends and family when he left to serve his country, and I thought of the amount of bravery it must take to even do that. I thought that there would be no way to properly honor him for his sacrifice but I was glad to do something. When I talked about his stone at the top of the mountain I thought about his family and how they must miss him. I thought of the family at their camp where the stone came from and I thought of them having fun together. I thought about what his family must have felt when they heard that he had passed, and I think of the impact that his passing has on everyone. I thought about how worried his family must have been when he left to serve his country, and at the same time how proud they were that he was brave enough to take that risk for his country. I wondered what he was thinking while he served and what kept him going, I could only imagine how hard it is to risk your life for your country, I thought about how much I respect him for what he did and how proud his family must be of him. CPT Tranchemontagne had a big impact on his community, his family, his friends, and his fellow soldiers. I highly respect him for the sacrifice that he made to help his country, and for his bravery and valor for fighting for his country, I respect his family for supporting him in the decision he made to fight for his country. Even though he did not fall in battle he still died as a soldier, he died strong and he was a brave man,I commend him for his sacrifice and I thank him for helping his country. extraordinary day, and a privilege to honor such an elite group of heroes. I wanted to take the time and opportunity to thank everyone for inviting me to carry Captain Danial J. Tranchemontagne’s stone. Carrying his stone with the Summit Project was an inspiring experience. It was even more inspiring to read his story. His story truly reflected a individual who was a consummate professional both in and out of uniform. As a service member and Mainer myself, I found Captain Tranchemontagne’s story inspiring not just to read of him as a soldier, but as a teacher as well. It is in the commitment to his professions that I find extraordinarily touching for he fulfilled the role of an individual who chose to serve here at home and abroad. I was never fortunate enough to know his story personally but it is never the less hard to not overlook the connections with someone who I would have otherwise thought a stranger. As a USM student, a service member and with my own appreciations for mathematics, I found we had a quite a few things in common. Again his story is that of an all around consummate professional that I could only ever hope to aspire to be. I would also once again like to thank everyone and the Summit Project for tendering to me the opportunity to learn Capt. Tranchemontagne’s story not just as soldier, but as a wonderful human being. Thank you for allowing me to share his story where ever the opportunity was available. I was the hiker who had the privilege and honor of carrying Daniel’s stone up The Owl at BSP this year. Words cannot express my gratitude for allowing this to happen, and how big of an honor it was to carry his stone with me the entire weekend. James, we met for briefly during the TSP alumni event at your restaurant. We quickly exchanged introductions, but what became clear during my time at the event was the love that you and your family had for your brother. I leaped at the opportunity to carry your brother’s stone and I quickly began tearing through any information that I could find about him. What struck me right off the bat was the fact that he was a teacher. I have strong views that teachers are the foundation of this beautiful country and that it is truly incredible that not only was Dan teaching America’s youth, but he was also protecting their future outside of the classroom by giving his time in the Army. Furthermore, after reading Angela’s comment on the TSP website, it struck me that he was frustrated post-9/11 that he was not active at the time. I think that just goes to show how incredible of a man and a protector that Dan was. It quickly became evident that Dan was not just a tremendous brother, but an incredible human being. The world will truly suffer from his loss. The event this year was incredible, and while the Tranchemontagne family was not able to be present, I kept them in my thoughts all weekend. I loved feeling the burden of Dan’s stone on my back, because I knew that was his was of saying that he was watching over us all weekend and that we were safe. I just wanted again to say thank you so much for the honor and privilege of carrying Dan’s stone at BSP this year. Learning about his life is something that I will keep near and dear to me for the rest of my life. I apologize for the incorrect date. I meant16 Aug 2015 vice 16 July 2015. On a beautiful day Saturday morning on February 27th, I had the honor of carrying Army CPT Daniel J. Tranchemonagne’s stone. We did a 4 mile hike around our beautiful city of South Portland. What an Honor it was. I did some research to see who he is and what his story is. The information that was found made me think that we were on a similar path in life. He loved Life and loved working with children. From the time he was in high school working with kids at the summer camps, to his career teaching math at Scarborough High school, he made a difference. I have worked with the children at the Boys & Girls Club of Southern Maine, South Portland Clubhouse and also at Head Start for 16 years. Doing this walk with 25 children ranging from 10-17 years old from the Boys & Girls Club of Southern Maine, I kept thinking that Dan was walking right along with us. When my pack started getting heavy, my husband (who was walking with us) came walking up beside me and handed me a stone that I just stepped over. It was in the shape of a heart…..In that moment it was confirmed that Dan definitely was here along with all the other Fallen, helping the children and adults get through this very emotional day. I will forever keep that heart shaped rock and will always remember Dan will speak of him often. My name is Sonny Sylvester. 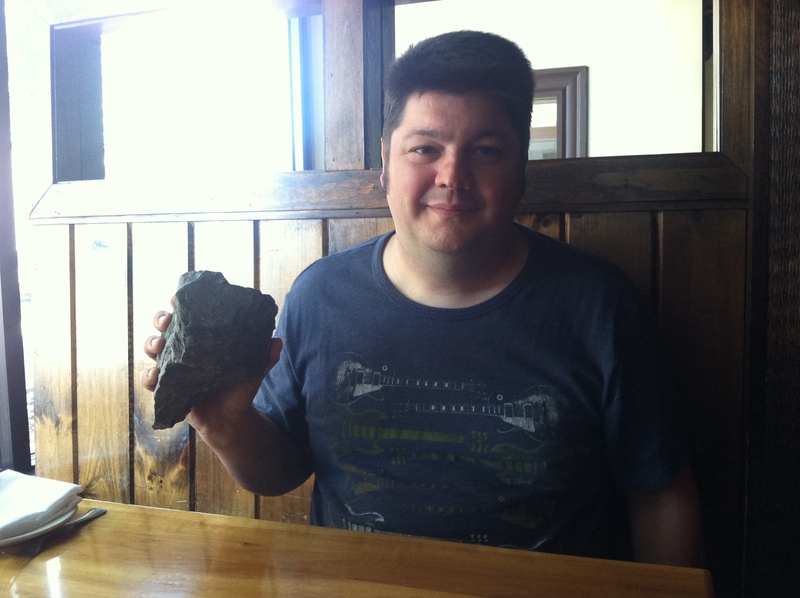 It was my honor to carry Daniel’s stone from Portland to Millinocket for his family during The Summit Project ride. Memorial Day weekend is one I will never forget. I went as a stranger and left with friends and “family.” It was raining on the way up the mountain, the climb was challenging for all, and it was sleeting at the top. All of this was insignificant compared to successfully completing our purpose, our mission. From what I have learned, this is what Daniel would have done too. I was honored to be able to carry his stone and share his accomplishments with my team. For me, his story did not dissolve upon returning his stone. I will carry it with me. Capt. Daniel J Tranchemontagne will not be forgotten. “Always the teacher.” Words written by a father. Words that will always keep a place in my heart. Those words are the ones a father used to tell the story of a fallen hero. The father of Daniel Tranchemontagne. On a beautiful Saturday morning, myself, along with the late addition of Buddy McClain, took the trek with the stone and story of a fallen loved one. The story of Daniel was one that hit very close to me. Daniel was described as a teacher. Always willing to lend a hand when needed, always willing to help a fellow soldier or student with a lesson. The moment I took my first teaching course in college I knew teacher young children was the only path for me. I feel like some where along Daniel’s path he had that same realization. Daniel’s heart comes out in his father story. Being discouraged when he was not selected for active duty. He used that time to spend teaching others and offering his time to coach a youth soccer team. These similarities give me and Daniel a bond even though I’ve never met him or any of his family. Teaching and coaching is an amazing experience that I am proudly able to be a part of on a daily basis. On October 20th I had the honor of traveling up Streaked Mountain carrying Daniel J. Tranchemontagne’s spirit with me. I had a great time traveling along side him and was honored to get to know all about him and how he lived his life. Daniel J. Tranchemontagne was a true hero. He accomplished many amazing things even before he served. He helped those in need and never thought of himself while doing so. He was compassionate about his work and all his life he was helping others who couldn’t help themselves. I felt like I learned a lot about Daniel from the amazing story you wrote about his positive life. He encouraged me to try new things and not to always think about myself when I can always help others! Daniel did not die in combat but he still died a hero like any other soldier; maybe even more so. He was fighting for not only his country but his life. He didn’t allow his pain to stop him from saving others from pain. Daniel reminded me of my grandfather who served in the Vietnam War. My grandpa did not die in combat. Like Daniel he came home and passed away of cancer on November 23rd, 1989. On my trip up the mountain with Daniel I was able to learn about all the other soldiers that were also being brought up Streaked Mountain that day and I was honored to tell my classmates about his heroism and how much his life had affected mine and others he had helped. I would like to not only thank Daniel for his service but to also thank his family as well for raising Daniel as a hero. My name is William Barry. I am a Boy Scout with Troop 310. 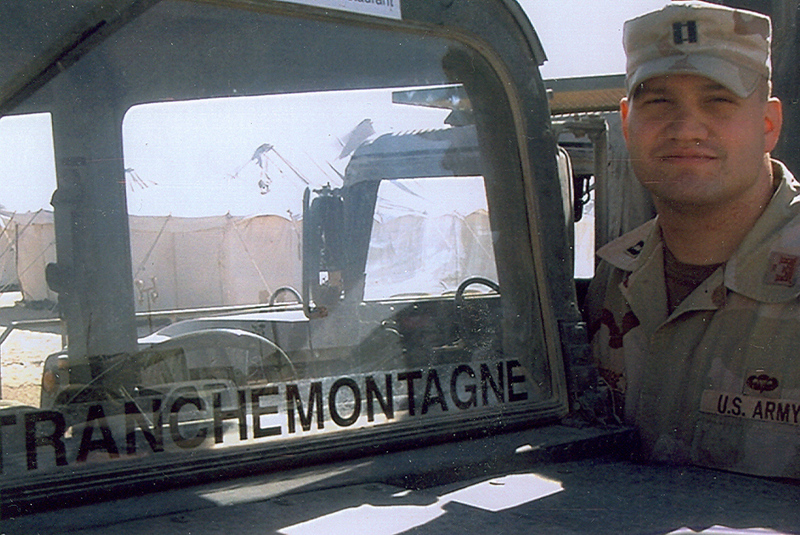 I had the honor of carrying the stone and the story of Army CPT Daniel J. Tranchemontagne. It was a sad story, and I feel very sorry for the family for their loss. I had many experiences with the stone on the hike from the Portland Jetport. I noticed we had many things in common, such as soccer and scouts. In my opinion, Daniel was a great man. I am glad that I had the chance to learn about Daniel and am grateful to him for his service and sacrifice. I had the tremendous honor of carrying Daniel’s stone on a hike to Fort Williams Park in Cape Elizabeth on March 11, 2017. It was a bitterly cold day, with biting wind, but as I carried Daniel’s stone, I thought about the perfect summer day you described when you found the stone at one of Daniel’s favorite places, your family camp at Sand Pond, and the cold didn’t bother me. I thought about the impact Daniel had on his students, how he cared so much about them and their lives, and the cold didn’t bother me. I thought about the sacrifices he made for others, and how he always put others’ needs before his own, and the cold didn’t bother me. I thought about his commitment to serving his country, and how passionate he was about that mission, and the cold didn’t bother me. Daniel’s memory was alive with me that day, and it kept me warm. I am so sorry his life was cut short by illness. As someone who works with children, I was so moved to learn of his dedication to his students. I’m sure I would have bonded with him had we had the opportunity to meet. I am so glad I had the opportunity to carry his stone and to get to know him just a little bit. On this evening of Army Captain Daniel Tranchamontagne’s 13th anniversary, I reflect on Memorial Day weekend at Baxter State Park and see clearly now what started as a bit of a soul search challenge morphed into something so much greater than myself. When I heard about The Summit Project, I knew that this was something that I needed to be a part of. This project fell right into lines with the question that I have pondered for so long about soldiers, especially since the births of my sons … what makes some people more brave and courageous than others? What makes someone feel that desire to defend our country and HOW can I instill that kind of bravery and courage into my four boys? I read every biography and Daniel called to me. I was so touched by Army Captain Daniel, he was brave, courageous, honorable, an amazing son, brother, a friend to all. He was grounded, an educator, a soldier, a public servant. I understood how his story went, it ended with an empty feeling of sadness and loss. I thought about how he could have chosen to remain an admired mathematics teacher, doing that good deed for young adults soon to make their world into adulthood but instead he chose to make the ultimate sacrifice, to serve our country. I thought about you and wondered what you were like to raise such a noble son? And while I understood, I really had no clue. I thought that because I am a mother, I get it. But I see now that I really don’t get it and fallen heroes families don’t expect us to GET IT and they learn to adapt and appreciate our innocence in not truly understanding the loss of a soldier, their very own loved one. They are thankful that we don’t have to know. What I started taking in after talking to you, is when a loved one takes an oath to defend our country, the entire family is doing just the same. Families dedicate their lives right along with their loved one. You as a family, were there right alongside Daniel until the very end. Those members that support those service men and women are so selfless and live out that bravery every day too. Every single day. You were no exception, Daniel neither. George, because I asked, you shared with me a little about your career, your lifetime commitment to the Navy and how your wife Jackie raised your six sons while you were deployed. You said how appreciative you were that Jackie was there to raise your boys right. You mentioned many deployments. You mentioned many different places that you lived but what I heard was how you kept the family unit together. I asked you what your secret was to raising noble sons, was it embedded in your DNA or something that you and Jackie instilled in them? You mentioned that only 2 of the 6 went military. You chuckled a little, almost like you weren’t exactly sure of the answer at that moment or so I thought … or maybe you chuckled at how naive my question was as I am only a mother 12 years young, or maybe you chuckled because you believe that Jackie was the key to your sons’ success along with you. You said that you would have to have Jackie answer that. Clearly a courageous soldier you are with that brave DNA, directing me to your wife. I took note of this. You said you just raised them believing in putting our country first, you lived a life putting our country’s needs ahead of your own, it was just something that you all believed in. I couldn’t help but feel the word selfless screaming inside of me. If Daniel were here, he would tell you that YOU and his oldest brother Marc were his heroes. All of his brothers he appreciated. You said what was strange is that you never pushed the military on them. You spoke of how they were around it but you and Jackie just taught them to be the best that they could be. George, remember when I called you back, you said thank goodness that I did because Jackie wanted to hear about me, did you ask me how old MY boys are, did you ask me about myself? I thought about where Daniel’s traits of selflessness came from. Daniel would have been the same way. I thought about the re-gifts that Daniel did for the soldiers with empty hands in the mess hall. I thought about Jackie’s quote in the paper talking about a grieving young mother and how her heart ached for her. I thought about how you praised Walter Reed and thought about Daniel not sharing his illness with his friends so he wouldn’t burden them. When I spoke with you Jackie, you said that you just needed to teach your boys right from wrong, that you have always lived just one day at a time, there was no secret in what you did. If Daniel were here, he would respectfully disagree with you because YOU did so much more than you will ever take credit for. On the hike, I thought of you at home raising six boys, often alone. I wondered if you ever had any other dreams for yourself? I thought about you George, deployed, away from your wife and boys to put your country ahead of yourself and now I think of your family’s sacrifices too. George and Jackie, you really take me back the same way that Daniel’s story does. Selfless. Daniel wants your story heard too. The seven hours I spent on the hike, the 4 hour drive up, the 4 hour drive back I couldn’t help but think about how brave and courageous Daniel’s family is too. I’ve spent the last few months thinking about him every day and what I heard on that mountain from Daniel was that I am to deliver this message. A message of love and appreciation, he wants your story to be heard because after all, you are family and you go through life together. On our hike up and down we talked of our soldiers. We had a lively young group and carried the stones of lively young solders. Daniel was in good company. Daniel would have been looking out for them, he would have enjoyed the physical challenge of the mountain, the breathtaking views, the sunshine. He would have loved the sunshine at Sand Pond. I will visit you there someday soon. At the summit, we all talked about and listened so carefully about the 8 other fallen heroes in our group. Daniel’s weight was lighter although I must confess, I feel like Daniel’s weight has always been kind of light because of his desire to care for us, to protect us. I spent months gathering info and scoured for every last bit I could find to have a better feel for Daniel and the weight of his loss but it was only at the base of Baxter State Park at the Summit Project’s Gold Star Family stone ceremony that I realized that I really have no clue and there is no amount of preparation, research or print that can give me that knowledge. Daniel’s kind heart and love to make others feel good has reassured me that it’s OK not to know. YOU have reassured me that it’s OK not to know, just take one day at a time, teach right from wrong and the rest will fall into place. Trust in this, have faith, teach, learn, do good to others, be the best you can be, put your heart and soul into it like Danny did. Never sit from the sidelines. I know the fallen heroes and Gold Star Families know that us hikers try our hardest to honor the privilege of carrying the stone and story to the summit but we can never truly understand and for that reason you appreciate us too. We will be the body of the families when you need us to carry your loved one’s story and we pledge to carry their story for a lifetime. God Bless you Army Captain Daniel and family. I would like to personally thank you for sharing your brother and his life with us and others who take part in this amazing program. On September 11, 2017 I had the honor to carry Daniel’s stone from the University of Southern Maine Portland campus to the President’s house on the Gorham campus. The significance of 9/11 for the OIF/OEF veterans cannot be overstated. Reading Daniel’s story and watching his brother’s video reminded me of this. It reminded me of how many good, kind, and respected people were called into service that day. I chose to carry the stone in my hand for the length of the hike. Reading that Daniel was an active traveler and athlete, I felt it might be fitting for the stone to be out in the sunshine. This had the benefit of not letting me forget the purpose of my walk. Every once in a while I would have to change hands or adjust my grip. These adjustments served to constantly remind me that I wasn’t just walking through town on a clear summer day. Reading Daniel’s story it struck me that we don’t often think about the human aspect of being a soldier. As an airborne linguist, I spent my career in the Air Force trying to prevent casualties of war. My time in service was so narrowly focused on that, I believe I forgot that service members are still human and susceptible to more than bullets. Daniel’s story and legacy have inspired me to make a more concerted effort to remember the fallen. Specifically, I am compelled to make sure that service members are remember for the people that they were, not just their medals and uniforms. I never had the privilege of knowing Daniel, but I can now say I have the honor of remembering him. For that I thank his family and this project. On October 14th, I had the honor of carrying Dan’s memorial stone to the summit of Cadillac Mountain. It was a privelage to share with others what I have learned about Dan. I never met Dan, but I feel a connection to him. We grew up in the same home town, went to the same high school and later went on to USM, and both grew up in a family with six children. Fifteen days before Dan died at Walter Reed National Military Medical Center, I graduated from nursing school. I’ve thought a lot about that over the past few weeks. Today, I work at Maine VA Medical Center Togus caring for veterans. I am impressed with Dan’s selflessness and how evident it is that he made a difference in the lives of others both in the military and in his civilian life. I am amazed by how much he accomplished and how many lives he touched during his 32 years. I am grateful for Dan’s service. On October 28th 2018 in the midst of rain and snow, the members of Boy Scout Troop 304 in Kennebunk carried the stones of our fallen heroes to the top of Deer Hill in Evan’s Notch. This hike was a challenge given the conditions along the trail for all of us. At the top of the hill, we all read the information for each of our stones. I have never seen the boys so solemn and quiet. I think we each felt for the families of our service men and women during the ceremony. This hike has even more significant feeling for me as, when I heard Dan’s name, I knew I had to carry his stone. I was an Assistant Scoutmaster for Troop 327 with Blaine Porter in the early 90’s and knew Dan as a Scout in the Troop. I remember Dan as a full of life, funny, and dedicated teenager. We had some great times camping and doing service with Scouts. He was part of a great group of boys I knew during that time. I was not surprised to read George’s account of Dan’s life relating his dedication to kids and teaching. I could see that in him even at a young age. As a pediatrician, I know the both dedication and rewards of working with kids and teens and can appreciate Dan’s desire to make lives better. It seems he touched a number of lives with his efforts as evidenced by the accounts of students he influenced during his short time. Thank you for allowing us to honor his memory with a stone at the Summit Project.